1) Register! Registration link for the event via the "Registration Link" on the left side of this page. Please be sure to register. Districts 7120, 7150, 7170, and 7190 have arrangements with their clubs for one President Elect for registration. If more than one PE (or future PE) wishes to attend, they should discuss with their District Governor Elect. 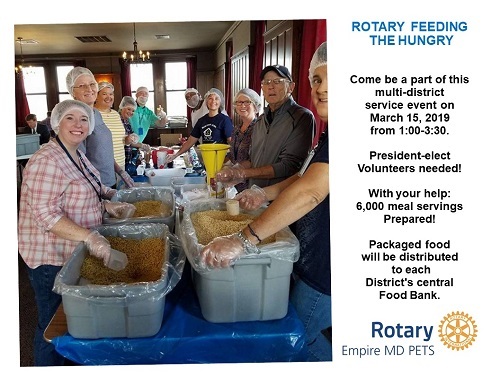 PE's from other Districts are welcome to attend Empire MD PETS, registration & meal costs will be provided upon request. Spouses and/or guests may also register to attend the Friday night dinner (dinner cost will be specified during registration). 2) Book Room! If traveling from outside the Syracuse area, you will need to stay over on Friday night March 15. For the Sheraton - our special room rate ($130 + tax) is also available on Thursday or Saturday night. You do need to book your room separately from registering for the event. Room costs should be discussed with the PE's home club regarding reimbursement (if available). Please book your room by February 10 to make sure you get the discounted rate! Click here to book your room directly with Sheraton. This link INCLUDES the Empire PETS meeting discount code. 3) Plan! Work with your club, District Trainer, and District Governor Elect and attend all President Elect Training sessions that are held locally within your District. Attend other Rotary training sessions (Rotary Leadership Institute) and plan to be an active part of the District Training Assembly within your District. Start meeting and planning with your club's members that will be part of your "Board" during your term as President Elect! 4) Get Excited! The District Governor's Elect and the Empire MD PETS planning committee have arranged for some fantastic guest speakers and presenters. Your year of President will be one that you remember as a high point of your "Rotary Career". We look forward to you attending and participating at Empire MD PETS in March!